The edition of Ecomondo 2015 ended on November 6th, fortunately leaving much work to do for the commercial area of ​​Nova Somor. Visits to our stand were very qualified and meetings with more than 15 foreign buyers have been very profitable. Already some of these, in particular those related to Brazil and Morocco, have had a concrete and operational follow-up. We also received many compliments from those who had come to visit us in 2014 and were able to see our progress both in terms of technology and range. Last year we were present only with the prototype of the NS1, set up on a light structure with two bike wheels. This year instead we have exposed the NS1 completely renovated and adapted to tropical climates, very evolved compared to the prototype. We also had exposed NS2-B and NS3. It was a great success and, according to many of those who visited all the exhibition, we were also one of the few technological innovations that have chosen a new way and don’t perfect and improve traditional ones. Interesting is also the participation of Nova Somor with a second stand, the area dedicated to innovative start-ups. There have been conferences and events, the most important one that took place on November 5th for the awarding made by the Foundation for Sustainable Development. Nova Somor was awarded in the green section of the start-up and we made sure that prize was received from a person very special to us. For a couple of days in fact was present at Ecomondo Gildo Gasperini, son of Daniele, who patented it in 1935 Elio Dinamic, the forerunner of our solarpump. And it was always him who, after the war, founded the Somor, from which we took the name. In those days there wasn’t any kind of sensitivity to ecology and Daniele Gasperini didn’t have any reward that he deserved. 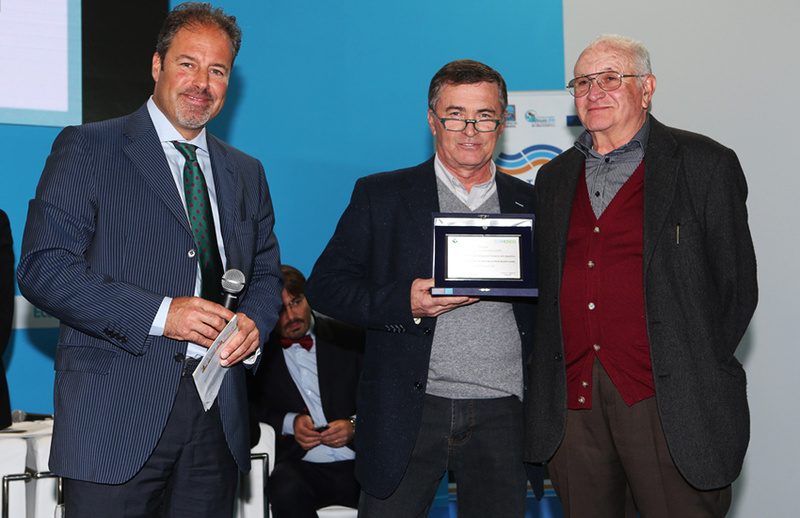 So we decided to offer the opportunity to Gildo taking the stage of the event and receiving the award together with our Roberto Belardinelli, as a form of posthumous recognition to the value of his father. It ‘was a beautiful and exciting moment, with a moment of embarrassment and sympathy for the host of the awards ceremony. When he announced the time of the “young green start-up”, he found him self beside two people certainly young in spirit, but a little less in age! So a very positive analysis at Ecomondo 2015, where we could achieve, during 4 intense days of work, a lot of visibility and many new useful contacts both for our business and also in terms of creating a more extensive network of contacts.